Sometimes you need a break from the monotony of the world and want to develop a silly project. That was my motivation for this post and idea to build a slack bot, which has many more use cases and simple silly commands. In this post, I’ll run down how to build a minimal slash command bot and deploy it to Heroku. Make sure we have Elixir and Erlang installed. If you are on a Mac with Homebrew, you can run brew install elixir. If you are not on a Mac or have Homebrew you can follow the instructions on Elixir’s website. Once we have Elixir and Erlang installed we can get started! Mix is Elixirs built in build tool. This will allow us to compile and run our project. Our dependency list is very minimal but very important. These instructions taken from the Readme’s on both projects. Note: you can change the port to any number you want, the default port is 4000. Let’s install our dependencies now! Run mix deps.get. Open up coffeebot.ex. This is our main file and we will keep everything here for the sake of the tutorial. We defined the router for Trot to use in our config file so we needed add it to our module. Next we imported the Trot.Router which gives us access to the methods we need for our router. We are using a basic route, just going to the index of the server and serving up a “Hello World”. Seems simple enough! Let’s try it out! Run mix trot.server to compile the app and serve it at the port we specified above, 4000. Visit your browser at, http://localhost:4000 and you should see Hello World. Which is saying that there is no route for “get /favicon.ico”. We don’t care about the favicon for this example so we can add this line just above the last end, import_routes Trot.NotFound. Save it and it will recompile the app for you. No more error! Now that we got our initial route, we can flush out the rest of it. The only things we care about, in this example, are the repsonse_type and text. Let’s change our “Hello World to be in the format”. Here we are using Elixir’s Map data structure. There are two repsonse types, in_channel and empheral. Empheral will only show the message to you, and in_channel, well, will show the message in the channel the command was given from. Save your changes are refresh your browser, you should see the new payload. So we have the message we want to send back to Slack, but we need to be able to handle the incoming request and send the correct response. Let’s do that now. Trot gives us access to the conn variable, this stands for connection. In essense, we are taking the conn, transforming it, and returning it. This is how Elixir and functional programming works! In the middle you notice the |> Poison.encode!(). 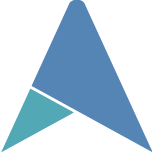 The |> (pipe) operator feeds the result of the previous line into the next function. Very handy for chaining things together. Poison.encode! turns our map into JSON for Slack to consume. If you save and refresh your browser, there should be no difference! Let’s deploy to Heroku now! Login or create your account at Heroku.com. Once you are in and on the dashboard, create a new app. You can name the app whatever you want, I like letting Heroku decide. Heroku should now take you to the Deploy page for your app. Here it instructs you to install the Heroku ClI and setup your git config. Please follow the instructions up until the actual deployment! Elixir is still a new language and Heroku doesn’t support the Elixir Buildpack officially. Fortunately, someone has made a buildpack for us. All we have to do for this to work is type heroku buildpacks:set https://github.com/HashNuke/heroku-buildpack-elixir in our console. Once that is done, we have a few more bits of configuration before we can deploy. Heroku will tell our app which port to use, so we need to set our port to be dynamic. We can make this simple change by changing our port number, from config :trot, :port, 4000, to config :trot, :port, System.get_env("PORT"). If you want to make sure its working you can run PORT=4000 mix trot.server and it will work the same. The Procfile contains any commands we want to run after we deploy our app, in our case its web mix.trot.server. Web, in this case is the default process for Heroku apps. Create a Procfile, without any extension, like .txt, etc. Place the following within the Procfile: web mix trot.server. Add and commit your new files to git and run through the rest of the instructions on Heroku. We can now deploy to Heroku. Run git push heroku master. It will build and deploy your app. remote:  ! Push rejected, failed to compile Elixir app. Change your mix.exs file change elixir: "~> 1.3", to elixir: ">=1.2.6",, then add, commit, and push your files again. Going back to our Heroku Dashboard, we can click the Open App button, we will need this URL for Slack. With our app deployed on heroku, we can now create a new slash command. Easiest way to get there is to go to https://[your domain].slack.com/apps/build/custom-integration. Make sure you put in your teams domain. Select the slash command and lets get started. You can configure a description and name for your command. I called mine coffeebot. You are free to choose which name you want. Let’s save the integration and test out our command! 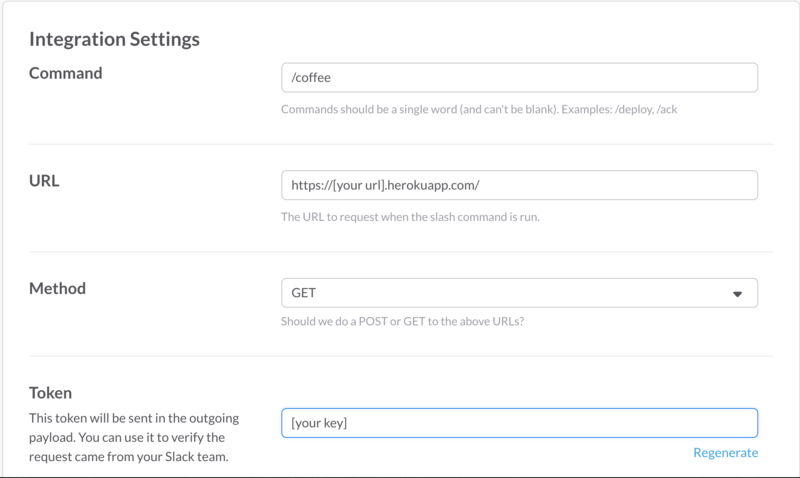 We can lock down our api key by parsing the request we get from Slack and comparing it to the key they gave us. This should be done for security sake, This may be covered in an upcoming post since this one is a bit long. Once we start throwing in some more code we may want to break things out into separate modules and we can use the same Heroku node to serve up separate commands. Just add another route! So we created a very simple slack bot, deployed our app to Heroku and, hopefully, got some coffee. Some of the use cases arising from this integration would be, a command to deploy code to your servers, a command to get the weather for a certain area, or maybe we want to make more silly/useless bots. If you run into any issues, please feel free to reach out to me by any of the means below.